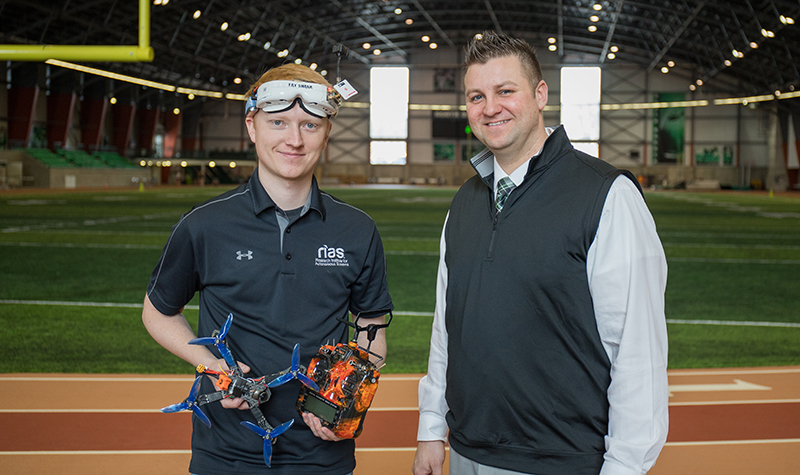 This weekend, April 13-14, the UND High Performance Center will transform into a championship-tier drone racing course for the Collegiate Drone Racing Championship. Planning the CDRC required skills and knowledge across campus to pull off UND’s inaugural hosting duties. Photo by Jackie Lorentz/UND Today. Erik Martinson, standing in the UND High Performance Center, reflected on what it’s like preparing for an event UND has never held before. 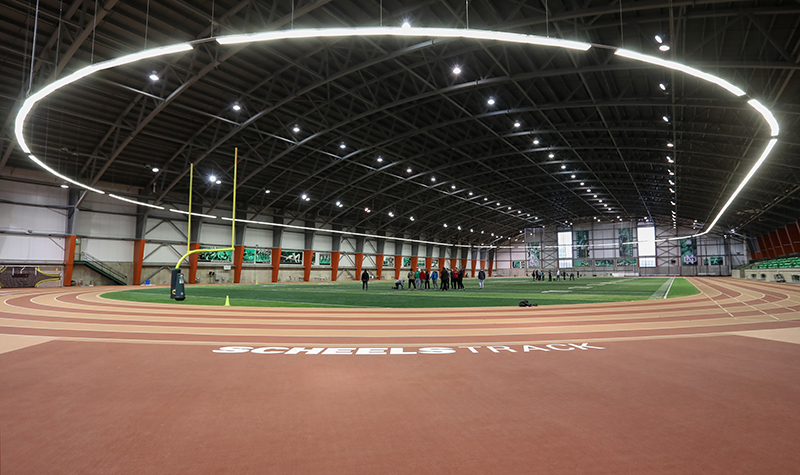 At the time, track athletes were sprinting and pole-vaulting in the state-of-the-art, 200,000-square-foot training facility. It wasn’t until a few months ago the University confirmed it was hosting the Collegiate Drone Racing Championship (CDRC). 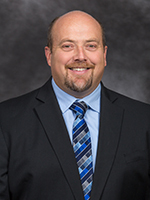 Since then, Martinson, associate athletics director for operations, has taken part in an unprecedented planning process. 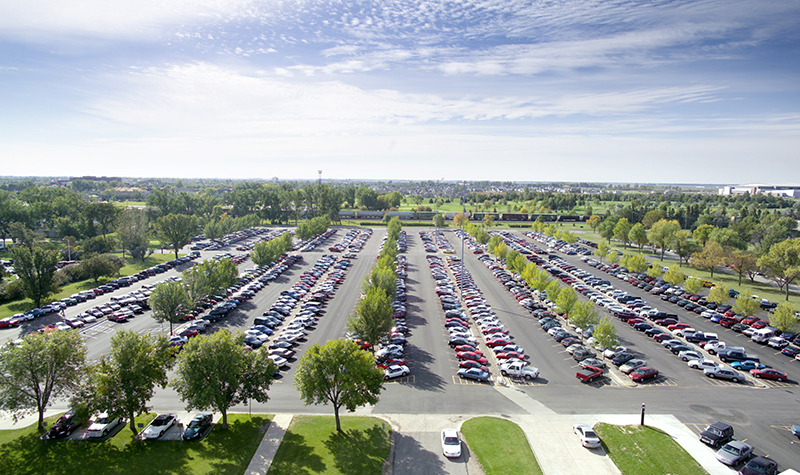 Campus entities represented in the crew include Athletics, UND Aerospace, the Research Institute for Autonomous Systems (RIAS), the Office of General Counsel and the Division of Research & Economic Development. The HPC hasn’t played host to a national championship before, but the facility has seen plenty of use by both University programs and community activities since its opening in 2015. 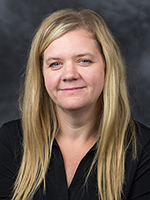 Martinson, who oversees all things operations and facilities for Athletics, says it has held high school track meets, soccer clinics, football practices for other institutions – even the ROTC units on campus utilize the space. He pointed to the names of donors that wrap around the walls of the HPC as the foundation of UND’s vision for the space. This weekend’s racing won’t be the first occurrence of drones flying in the HPC, either. The local Red River RC Flyers Club has flown an assortment of RC craft in the building for two of their bigger club events, including smaller versions of the quadcopters to be flown in the CDRC. Even so, adjustments are being made to the current infrastructure to accommodate the championship scale. Martinson says the biggest changes ensure spectator and pilot safety; new trusses have been installed, with the help of HB Sound & Light, to hang netting containing drones in the racing area, where they’ll fly loops and hairpin turns through gates and obstacles. “We’re going to utilize quite a bit of the space,” Martinson said. Krueger (left) played a crucial role in the early planning stages, getting officials up to speed on the necessities of hosting a competition like the CDRC. Martinson, overseer for athletic facilities, has taken the steps necessary to have the HPC ready. Photo by Connor Murphy/UND Today. One of the largest obstacles to hosting the CDRC for the first time was the fact that, outside of the UND UAS/RC Club, few on the team had proper exposure to the world of first-person-view (FPV) drone racing. That’s where senior Jordan Krueger entered the picture. As highlighted in Tuesday’s story, Krueger is one of the fastest racers in the country and the leader of the UAS/RC Club. In February, he took his first trip to the MultiGP Drone Racing Championship in Las Vegas. Early on, he was the go-to expert for many on the planning team. He was at last year’s CDRC and knew more than most about the structure of drone racing competitions. RIAS Communications Director Naomi Hansen went with Krueger to Vegas, as the institute had just hired him to help plan the CDRC and sponsored his participation in the MultiGP event. With 30,000 registered pilots, MultiGP stands as the preeminent drone racing organization worldwide. On the organizing side, Hansen says the Vegas event provided a good visual – seeing the structure, personnel involved and how a racing event works overall. She says it brought Krueger’s perspective and insider knowledge into focus. It also led to MultiGP partnering with UND for the CDRC. Longtime announcer and commentator Joe Scully will be at the HPC, displaying his talents as event emcee. He has 17 years of experience in the role and serves as executive vice president of race production for MultiGP. “They bring years of experience and the support of the larger community to this event,” Hansen said of the racing organization. Outside of UND, other sponsors for the event include HB Sound & Light, Northern Plains UAS Test Site, General Atomics, BETA FPV, Insitu and Northrup Grumman. Mark Askelson, executive director of RIAS, says Athletics has been a phenomenal partner in preparing the HPC for an important weekend. Everyone on the preparation team, across the board, has gone above and beyond to get the University to this point, he says. Chaves also credited Martinson for his operations know-how and handling the fast-paced planning with a great degree of coordination. 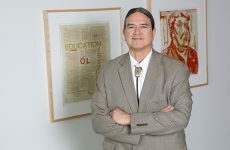 UAS Program Director Paul Snyder says when it comes to creating “One UND,” events like this are emblematic and couldn’t be done without each contributing entity. 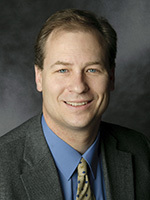 He’s looking forward to getting the public exposed to what’s happening in UAS and UND Aerospace. For the competitors, a social on Saturday night—at Robin Hall—will connect them with local UAS industry leaders and fellow students. Over 20 teams are expected to be in Grand Forks over the weekend. Additional sponsors for the CDRC: Collegiate Drone Racing Association, Flynoceros, Probitas Promotions, Appareo, FrSKY, HQ Prop, GEMFAN, Fat Shark, Northland Community and Technical College, North Dakota State College of Science, Einstein Bagels & Caribou Coffee, Papa Johns, Tim Hortons, Jimmy Johns, MultiGP, HYDRA FPV and BETA FPV.